This past Sunday (November 10, 2013) I went to my favorite NYC craft beer bar aka Blind Tiger Ale House for an event featuring some of The Bruery’s (Placentia, CA) most sought after beers. As with previous events my drinking strategy was to order my beers in 5.5oz glasses so I could try as many beers as possible. In turn, I was able to try 7 beers, 6 of which I hadn’t tried before. The first four were already being poured when I got there, but the last 3 were saved for when Ben Weiss (The Bruery’s director of Marketing) arrived around 3:30pm. The following are my tasting notes for the beers that I tried. 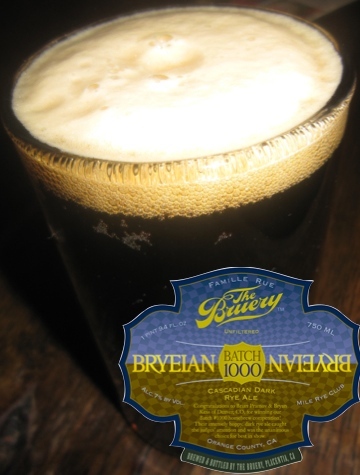 Batch 1000: Bryeian Ale (Rye Black IPA, 7% ABV) – Brewery’s Description: Bryeian is the winner of our Batch #1000 homebrew contest!…A cascadian, dark rye ale to be exact. 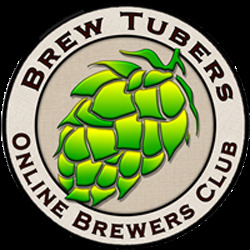 Brian Pramov and Bryan Keas, a pair of homebrewers from Denver put together this winning recipe for us and it shined brightly in our competition. The roast of the dark malts, the spice of the rye and the intense hop character combine for a fantastic experience. Bottleworks XII (American Wild Ale, 8% ABV) – Brewery’s Description: Our collaboration with the Bottleworks beer store in Seattle was one of the most popular beers we’ve ever made. We agreed with the masses that it was delicious so the decision to make it again came eeeeeeeasily! This strong wit beer was soured while aging in oak barrels before we added raspberries to the beer for an added, tannic, fruity, most-excellent flavor. 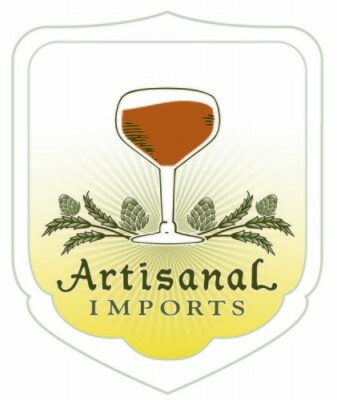 While it was taken out of the witbier style by an increased ABV, souring from barrel aging, and added raspberries. This beer still looked like one with its cloudy straw to orange appearance. Its aroma was full of mouthwatering funky and sour wild ale notes, which reminded me of a gueuze once I took my first sip. To me the raspberries weren’t really noticeable, but I still enjoyed this limited-release beer’s tart lemon notes, lactic sourness, and wild ale funk that were joined by earthy “barnyard” notes in the finish. Rating: 8/10 – a well made wild ale with a familiar flavor profile that all sour beer lovers can enjoy. Humulus Lager (Imperial Pilsner, 7% ABV) – Brewery’s Description: We promised we wouldn’t brew an IPA, and this is the closest we’ve come to breaking that promise.Humulus Lager is an extremely aromatic, hoppy beer, with citrus, pine, and intense herbal characteristics. We brew this beer with more than 3 pounds of hops per BBL, and it shows. We also use rice, a typically despised ingredient in beer, to lighten the body and make it more true to the American lager style. After admiring this hoppy lager’s light gold color and fluffy white head I took my first whiff and became a bit confused. 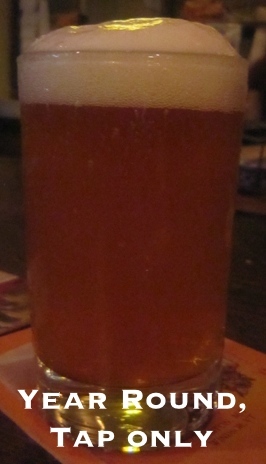 To me the beer smelled and then tasted like a double IPA whose hop character (particularly flavor) had started to fade. Meaning, it had a west coast citrus and floral hop character, but it was immediately joined by a noticeably sweet caramel and bread malt backbone. Also, the body lacked the lager crispness that I hoped the beer would have. To The Bruery’s credit this beer was shipped across the US and could have been stored incorrectly at some point in its travels to the bar. 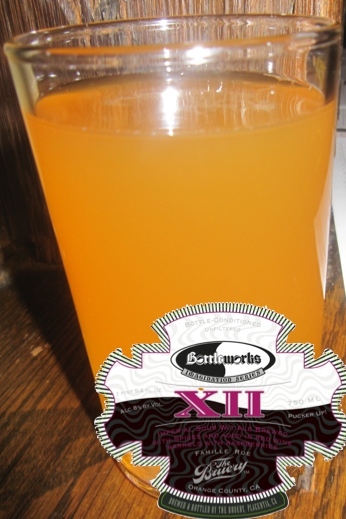 I hope I can try a fresher version of this beer sometime in the near future. Rating: 6/10 – from the flavors I did pick up, I could tell that this beer is probably amazing when fresh. 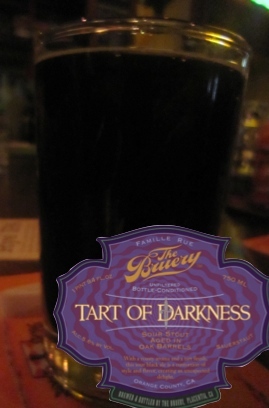 Tart of Darkness (Sour Stout, 5.6% ABV) – Brewery’s Description: We brewed a stout – no, not Black Tuesday, this one is low i abv if you can believe it! But we then decided to put it into the barrels that previously housed Black Tuesday and various other strong ales and added our special blend of souring bacterias and wild yeasts. The result is a perfectly tart yet awesomely dark and roasty sour stout. Not a style you will see very often, and in our opinion, not a style seen often enough. Summer Release. As its name denotes this uncommon blend of styles poured opaque black with red highlights on its edges when held up to the light. At first the wild ale (tart) portion of this beer dominated the aroma, but as I enjoyed the roasty stout flavors blending with wild ale sourness and funk in the taste…The stout notes made their way into the aroma. In general, my experiences with this beer have followed this progression. In other words, as this beer gets closer to room temperature its stout base’s flavors become increasingly apparent, and its overall blend of flavors becomes more and more exciting to drink. Rating: 8.5/10 – a well executed bridging of styles! 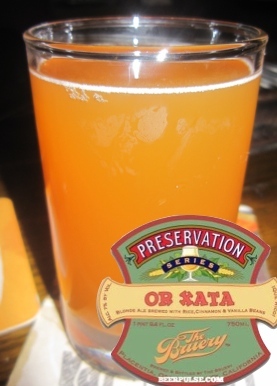 Or Xata (American Blonde Ale, 7% ABV) – Brewery’s Description: Horchata is a traditional, sweet, milky drink originating in Spain and Latin America that has become quite popular in Southern California, particularly with Mexican cuisine. Our take on the traditionally non-alcoholic drink is a blonde ale brewed with a heavy dosing of rice, cinnamon and fresh vanilla beans along with lactose for a little extra creamy character. If you didn’t know better, you’d think it was carbonated horchata. Although not as apparent in the picture that I took, this creative concoction of a beer poured straw in clear with a white head and great clarity (considering lactose was added). The aroma reminded me a bit of a lager with notes of grassy hops and lemon rind. However, in the taste a unique sweetness blended with those flavor notes to make for a truly new and exciting drinking experience. At one point the sweetness reminded me of Sixpoint’s Sweet Action, but after talking with a few other bar patrons who were also drinking it. I realized that this sweetness was a blend of the added rice, lactose, and vanilla; a combination that I can’t say I’ve had before. With it’s medium mouthfeel and creamy body, Or Xata was a quaffable and delicious beer to drink before heading to my final two beers which were sure to be quite complex and full bodied. Rating: 8/10. 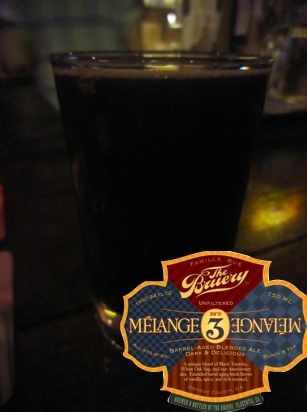 Melange #3 (American Strong Ale, 15.5% ABV) – Brewery’s Description: Melange #3 is a blend of three bourbon barrel aged strong ales. White Oak Sap, a wheat wine, our Anniversary Series old ale and our imperial stout, Black Tuesday, join forces in this luxurious strong ale that links some of the best characteristics of each of the contributing beers. Chocolate, dark fruits, oaky vanilla and rich toffee-like character reach through the bourbon veneer for an intensely satisfying quaff. Being that I can not include myself amongst those who have been fortunate to try The Bruery’s coveted Black Tuesday. I was quite excited to be able to try this blend of beers that has it as one of its components. In terms of appearance the Black Tuesday and Anniversary Old Ale both contributed to this beer’s dark brown to black appearance and lack of head. Upon my first whiff and sip I was entranced by complex notes of bourbon, vanilla, and dark chocolate. Then as I sipped on toffee and dark fruit notes from the old ale came through to make this beer’s flavor profile all the more complex. For 15.5% ABV this creamy full bodied beer drank impressively smooth with minimal alcohol heat in the finish. Rating: 10/10, while Black Tuesday’s imperial stout and bourbon flavors* dominated the overall flavor profile of this beer; its complexity and drinkability were quite a treat. I hope I can get my hands on a bottle of this someday. *While I know that all three components of this bourbon were aged in bourbon barrels, Melange #3’s flavor profile reminded me mostly of a bourbon barrel aged imperial stout. 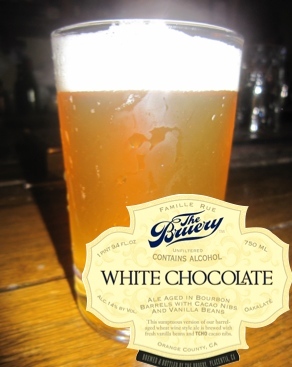 White Chocolate (Wheatwine, 14% ABV) – Brewery’s Description: Essentially a summer barley-wine style ale, but made with a wheat heavy grain base, the primary component of White Chocolate is a beer that we affectionately refer to as “White Oak Sap” as it is 100% bourbon barrel aged and is the wheat wine component of our White Oak ale. After nearly a year in used bourbon barrels, the beer comes out rich in coconut, honey, caramel and vanilla. To compliment the already rich flavors of this beer, we’ve added cacao nibs and fresh vanilla beans to give this beer the delicate flavor of white chocolate…hence the name. True to it’s description and name, this beer was definitely white chocolate in a glass. It poured hazy light gold in color with a nice white head. Aroma-wise, my first reaction was “cookie dough ice cream”. This characteristic was also in the taste and helped make this beer a great “dessert” / last beer of this epic tasting of beers from The Bruery. As it warmed notes of tart wheat malt and vanilla inched in along with bourbon barrel character and a hint of roasted pecan. It was these additional flavors that helped prevent the white chocolate / cookie dough flavors from becoming overly sweet and or one note. Lastly, at 14% ABV some alcohol heft and heat were apparent, but never becoming overwhelming. Rating: 8.5/10 – a perfect dessert beer for those who like white chocolate and or cookie dough ice cream. Cheers to The Bruery and Blind Tiger Ale House for putting together such an amazing list of beers for this event!!! This entry was posted in Beer Reviews and tagged Batch 1000, Ben Weiss, Blind Tiger Ale House, Bottleworks XII, Bryeian Ale, Cascadian Dark Ry Ale, craft beer, Humulus Lager, Patrick Rue, Tart of Darkness, the bruery, The Bruery Melange 3, The Bruery Or Xata, The Bruery White Chocolate. Bookmark the permalink.